Thirsty Pilgrim: If 'Forced Carbonation' Sounds So Wrong, Why Does It Taste So Good? If 'Forced Carbonation' Sounds So Wrong, Why Does It Taste So Good? 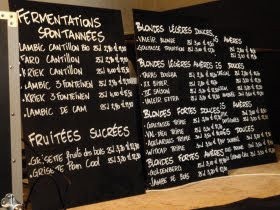 Another update on this weekend, courtesy of the Moeder Lambic team: The full stable of Cantillon beers will start pouring Thursday at Fontainas, not Friday. So there's some extra flexibility for travelers in town for (Pre-)ZBF as well as us lazy townies. Any thoughts on traditional lambic being served à la pression? Because surely there are some die-hards out there who hate it. And more simple hedonists like me who love it. And lots of thoughtful wishy-washy types who have mixed feelings. I'd love to hear from any of you. Without going into a full-fledged review, we're lucky to have Rose de Gambrinus among others on tap nearby here in Milwaukee and I love it! As for lambic on tap, I´m also one loving it. The three year old bottled Broucsella is wonderful, but the two year old unblended lambic on tap is even better. Well, if you ask about Lambics à la pression at Chez Moeder Lambic Fonatinas, the whole cooling / draught system was designed so as to ensure the lines were as short as possible, and the top pressure in the egs as low as possible so as not to gas up the beer... (not to mention the block of 6 Angram Handpumps used for flat lambics). Call me reactionary, but I prefer my lambic flat. If you've got handpumps what is the point of serving it on top pressure? It's not like you have to worry about it going sour.